Note: All names of schools and people are pseudonyms. There is increasing evidence that using Merrill’s First Principles of Instruction as part of an instructional strategy increases learning. However, these principles are written in general terms, and little is written about how these principles function in the real world. Knowing how these principles are currently used in the real-world would extend our understanding of the principles and provide insight into how they can be implemented. Therefore, a study was conducted to determine how four award-winning instructors in higher education used First Principles of Instruction in their teaching. The instructors’ use of these principles is described and analyzed. In addition to these principles, several additional strategies for providing effective instruction emerged during the study, including instructor enthusiasm, compassion, organization, and expertise. Specific methods for using these principles in higher education are explored, and several important questions regarding the use of First Principles of Instruction are posed, particularly related to the use of real-world problems in instruction. Suggestions for future research and practice are also provided. Gardner, J., (2011). How Award-winning Professors in Higher Education Use Merrill’s First Principles of Instruction. International Journal of Instructional Technology and Distance Learning, 8(5), p. 3-16). One current theory of instruction is Merrill’s First Principles of Instruction (Merrill, 2002, 2007, 2008), which proposes five foundational principles of instruction which, when used, are proposed to increase student learning. Merrill states the following principles: (1) Task/Problem-Centered – learning is increased when instruction is centered on real-world problems or tasks; (2) Activation – learning increases when learners recall or demonstrate relevant prior learning and recall or are given a way to organize what they will learn; (3) Demonstration – learning increases when learners observe a demonstration in which a similar problem is solved and/or a similar task is performed; (4) Application – learning increases when learners apply what they have learned by solving real-world problems and/or performing real-world tasks; (5) Integration – learning increases when students reflect on, discuss, debate, or give a presentation on what they have learned (Merrill 2002; 2006). These principles can be converted into a cycle of instructional activities, centered on real-world tasks and problems. See Figure 1. Figure 1. Instruction can follow a cycle of instruction centered on real-world tasks beginning with activation and continuing through integration. There is some evidence that these principles increase learning. Thomson (2002) reported a study in which an online Excel spreadsheet course using First Principles was compared with a traditional online course teaching Excel. Basing the course on real-world tasks and using the four-phase cycle of instruction caused a 30% student improvement in performance accuracy using Excel, including a 41% improvement in the time taken to complete tasks (p.8). In a separate study, Frick (2009) discovered a significant correlation between student satisfaction with a course and the reported use of First Principles of Instruction. There is also evidence that these principles are supported by various instructional models and theories (Gardner, 2010; Merrill, 2002; Merrill, Barclay, & van Schaak, 2008). In addition, there is some empirical support for the individual principles (Merrill, 2006; Merrill, Barclay, & van Schaak, 2008). Additionally, several authors have described successful instruction that uses First Principles (Collis and Margaryan 2005; Mendenhall, et al., 2006; Gardner, et al. 2008). Growing empirical, theoretical, and anecdotal support for First Principles of Instruction warrants further investigation and understanding of how these principles operate in a live instructional setting. The study took place at a large western university. To ensure that I studied quality instruction, I selected four professors who had been recognized in previous years as the teachers of the year for the entire university. This recognition is very prestigious and is awarded to one of several hundred instructors for outstanding teaching at the university. Awardees are experienced instructors who were considered and selected based on the recommendations of their peers and the feedback of past students. It was assumed, and later confirmed, that the instructors selected for this study effectively apply some or all of Merrill’s First Principles of Instruction. Potential participants were identified from an online list showing past award winners on the university website. They were contacted twice via email and were asked to participate in the study. Of the winners for the past ten years at university, six replied to my emails. And of the six that replied, four agreed to participate in the study and were included as participants in this study. An important aspect of my relationship to these instructors was my employment as an instructional designer in the university’s center for teaching. In this role, I supported several departments at the university in developing and managing course content in Blackboard Vista, the university’s Course Management System. Because I worked directly with professors at the university, I was particularly well-positioned to gather relevant knowledge for this study. The purpose of this study was to find out how instructors use First Principles of Instruction in higher education. To gain a rich understanding of the instructors’ teaching strategies, I followed the advice of Glesne (1992) and gathered data from several sources: an interview with each instructor (which was recorded and later transcribed), an observation of the instructor in a teaching setting, and documents provided by the professor relating to their teaching philosophy and strategy. These documents included course syllabi, student evaluation feedback data, assignment descriptions, peer evaluations, and emails from students. These multiple sources provided triangulation of data for this study. Data were analyzed using thematic analysis (Glesne, 1992; Gall, Gall & Borg, 2007). I searched for any reference in the sources that referred to the use of any of the five First Principles of Instruction. In addition to themes directly related to First Principles, several other themes and patterns emerged from the data. Appendix 1 demonstrates the codes and associated themes that emerged during the study. All documents and transcripts were coded according to these themes and were then analyzed and are described in the following section. This section describes the findings of the data, which were analyzed using thematic analysis and grouped into categories defined by First Principles and other themes that emerged during the study. The instructors included in this study are described to provide context for who was studied. Instructor use of Merrill’s First Principles of Instruction is described. Themes that emerged during the analysis but were not specific to First Principles of Instruction are also described. The findings are presented as a description of how the instructors used each principle in the courses. The additional themes are then presented, including examples from each instructor. Tallies recording how often each principle was observed are presented in Appendix 2, which also indicates the source of the observation. In student evaluations, students described Dr. Kelley as “very approachable and friendly,” and “enthusiastic.” In the class I observed, she arranged the classroom in a circle and spent time chatting and laughing with the students before and after the class. Students described the class as “a comfortable conversation where we could discuss anything.” The nature of her relationship with students appears to be comfortable and enjoyable to Dr. Kelley and to her students. Dr. Bretton Wellington is a professor of Marketing in the School of Business at the university. He began his studies at San Jose State where he earned a bachelor’s degree in Marketing. After earning and MBA from Santa Clara University and a Ph. D. in Marketing from Arizona State University, he taught briefly in Arizona and afterward took a position at the university where he has taught for nearly 17 years. Most of his research focuses on the market diffusion of renewable energy and clean technologies. Dr. Wellington has a confident and an engaging personality, and peers in the School of Business who had observed his teaching described him as “”terrific in engaging students,” “very animated and energetic,” and “enthusiastic.” My observation of his teaching style confirms this description, and I found myself drawn into his presentation through his use of dynamic voice inflections and witty humor. The instructors’ use of First Principles of Instruction is described below. Results are presented according to the themes associated with each principle, and discussion of the findings follows the presentation of the findings. In one class, students plan out and executing lesson plans in the university pre-school lab. In another class, students do home visits to the families of their students, attend parent meetings and conferences and write reports on the meetings. Students also work in small groups to respond to real world scenarios they might encounter in their work as pre-school teachers. In one class, students assume the role of consultants for a real-world companies and perform a marketing audit. Harrison shared real-world, personal examples of the nutrition and development phenomena that she was teaching in lectures. Harrison embodied a personal example of excellent fitness and nutrition, as noted by her students. In one class, students used what they had learned by analyzing the contents of infant formula to see how well it matched important research knowledge. Students solved economics problems using complex equations. When lecturing, he created an itinerary on the board that organized the class. Referred to and built on the knowledge obtained in previous prerequisite courses. When beginning a lecture, she reviewed what was discussed in the previous class prior to lecturing on new content. She then previewed the key points of the day’s lecture, providing an organizing structure for the content to be learned. At beginning of the class period he asked questions to the students regarding more fundamental principles of economics, slowly progressing to questions about more abstract, complex principles, and finally moved into the content of the current class. Students learned from other students by observing and evaluating them as they planned out and executed lesson plans in the pre-school lab. Students listened to how other students responded to real world scenarios provided by Dr. Kelley, and also listened to Dr. Kelley’s feedback on their responses. Students were given access to several high quality marketing audits performed by students in previous semesters. Dr. Wellington provided many relevant examples from the popular media that illustrate the marketing audit steps to be applied by the students. Shared personal examples from her life of the nutrition phenomena and human development concepts presented in the lecture. Provided a personal example of excellent fitness and nutrition to her students. Showed and worked through an example of how to use an equation to solve an economics problem on the chalkboard. Students planned out and executed lesson plans at the pre-school lab. Students responded to real world scenarios provided by Dr. Kelley. Students performed a marketing audit, including several specific audit-specific activities. Students went to the grocery store and analyzed the contents of infant formula to see how it matched what was discussed in class. Students tracked their own nutritional intake and compared it with what they had learned in class. Students used a complex equation solved an economic problem in class and then used the equation to solve a similar problem on their own out of class. Dr. Kelley facilitated an in-class discussion with students on their experiences in the lab in which students shared insights with one another. Facilitated interactive class discussions by posing engaging and sometimes off-beat questions to help students to expand their knowledge of the subject. Described to students how the skills they are developing will be useful in the future. Student groups responded to real-world scenarios provided by Dr. Kelley in class. Other students learned from those sharing their responses while the sharing group applied their knowledge to the scenario. This was repeated by several groups on several occasions. Dr. Kelley facilitated the discussion by asking questions and also provided feedback and insights to each student group and to the rest of the class on how to improve responses and expand their knowledge related to the scenario. When teaching how to do each of the several specific market analysis tasks, Wellington provided students with multiple examples of the market analysis task, including examples from previous students and examples from the popular media. Students then performed the market analysis task and were later given feedback from Dr. Wellington on how to improve their analysis. In one class, Harrison directed students to read a nutritional case as a group and were given a worksheet to guide them through the process of applying their knowledge to solve nutritional problems. They then integrated their knowledge by presenting their solution to other groups. Students also learned from each other in the sharing process. This cycle was repeated several times. When teaching how to solve a difficult economics-related problem, Dr. Sumbramony first worked through the problem using a complex equation on the chalkboard. He then presented another similar problem and had students use the equation to solve a portion of the problem. He then gave them another problem to solve on their own for outside of class. In addition to the instructors’ use of Merrill’s First Principles of Instruction, several themes emerged as I analyzed the data for this study. This section briefly describe each of these themes. The first theme that emerged was enthusiasm. For example, Dr. Kelley describes herself as enthusiastic about child development, and in course evaluations, students described Dr. Kelley as “enthusiastic and very effective,” and that Dr. Kelley had “enthusiasm and love of the subjects we studied.” Perhaps this is why one student wrote, “I always look forward to class.” I personally found Dr. Kelley to be very engaging and enthusiastic as I interviewed her and observed her class. Dr. Wellington also exhibited enthusiasm as part of his teaching, and his peers describe him as engaging, energetic and enthusiastic. My observation confirms the presence of enthusiasm in his presentation and communication style, and I thoroughly enjoyed my interview with him. This enthusiasm is related to what Dr. Wellington calls his “stage presence,” which he attributes to his experience as an opera performer during his time as a student. Instructor organization was also noted as key to effective teaching. For example, Dr. Wellington mentioned, “I like a lot of structure,” and his course syllabus reflects this structure and appears to be very clear and easy to follow. Suzan Harrison also exhibited clear organization, and in our interview, she acknowledged “I work very, very hard and diligently to make sure I’m organized.” There are several components to this organization. Harrison’s students also appreciated her organization, and wrote that they liked the “learning objectives,” and the “outlines.” One student appreciated that, “She is consistent with the structure of the class.” Harrison’s syllabus is also quite organized and provides students with clear structure to the course. Humor was another theme that emerged in the study. For example, after observing Dr. Wellington in class, one if his peers wrote “the group laughter which followed (Dr. Wellington’s humorous comments) gave evidence of a very positive rapport between teacher and students.” Dr. Sumbramony’s was also very humorous, and students wrote that they “loved the humor,” that “his humor was excellent,” and that the class was “entertaining.” In the course I observed, Dr. Sumbramony told many jokes and some of the students even made their own jokes during the class. Reflecting on this, Dr. Sumbramony mentioned, “I create a relaxed, enjoyable atmosphere, (even though) we are dealing with difficult, complex things.” This relaxed, enjoyable atmosphere seems to facilitate student engagement in the class. Dr. Sumbramony took what he calls a “compassionate approach,” and his compassion for his students was apparent. He provided them with individual one-on-onetime, even in courses that have over 70 students. In these visits, he guided students through problems and assignments using what he calls the Socratic method, asking questions that guided the students to solving problems on their own. Students greatly appreciated this attention and were impressed with his love and concern for their success. One wrote that “he take(s) an active stance in making sure each of us in his class learned and understood the subject matter.” Another appreciated that he “was concerned with each individual student and took time to help anyone who needed it.” Perhaps this is why students wrote in their evaluations that “he has been my favorite teacher in the Econ department by far” and that he “should definitely be the teacher of the year.” In every class, Dr. Sumbramony sets appointments with students who are struggling and guides them through the content. He even calls students at home if they have missed several classes. This compassion and personal interest in each individual student certainly seems to increase student learning. The way that problems were used varied. 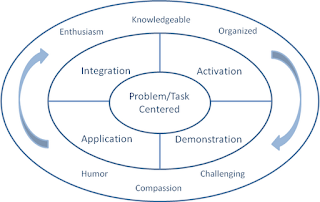 Previously, Duffy & Cunningham (1996) noted five ways that problems can be used: (1) the problem as guide; (2) the problem as an integrator or test; (3) the problem as an example; (4) the problem as a vehicle for process; and, (5) the problem as a stimulus for authentic activity. 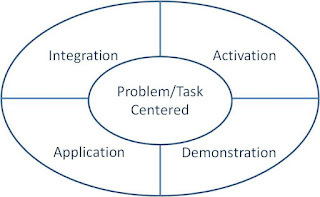 Merrill (2002, 2007) seems to emphasize a gradual transition during an instructional sequence from using problems as examples to using the problem as a vehicle for authentic activity. In this study, problems were used by the instructors in a similar way- as examples and as vehicles for authentic activity. However, the size of the problems used varied greatly. For example, as described above, Dr. Kelley directed teams of child development students to respond to parents’ complaints that had come up in the past at the school’s child care lab. This is a relatively small problem and in class, the discussion for each problem lasted roughly 6-7 minutes. However, the problem of dealing with parent complaints can be seen as one component of the larger task of working with parents, which is a component of the larger task of working as a child care professional. So, which of these is a whole task or problem? The question is important because the use of at least 3 whole tasks is described as vital to task-centered course (Merrill, 2009). But if the task or problem is so large that three tasks cannot be included within the constraints of a single course, then what should be done? 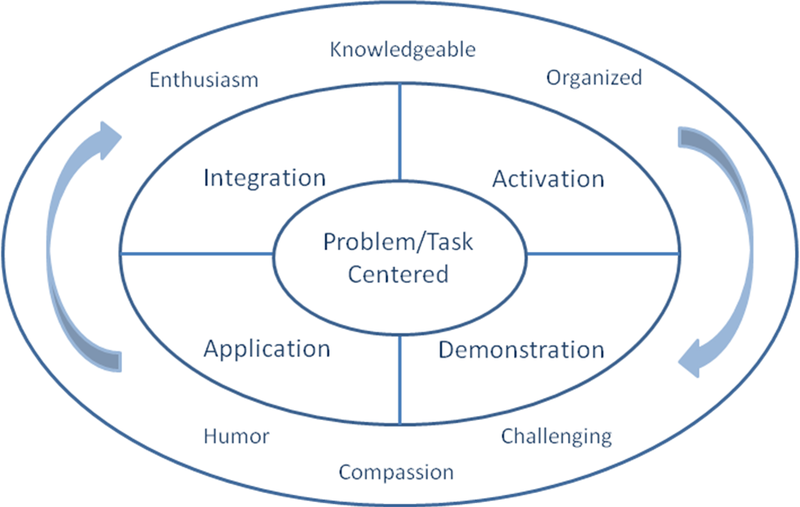 How big should a problem be in problem-centered instruction? An example of a very large whole problem or task is a market audit, which Dr. Wellington’s marketing students perform. This problem is performed over the course of the semester because the market audit is so large that there is not enough time to work through multiple whole tasks. Interestingly, Wellington appears to use the cycle of instruction for each component of this whole task, providing demonstrations and examples from current media and giving students feedback on their application of each component. So, are these components of a market audit several whole tasks in the course, or is the market audit? One could argue that the whole task of “working as a marketing associate” is taught over the course of a curriculum, and that the components associated with that task are taught throughout the curriculum. In both scenarios First Principles are used and a whole task is performed by the students. Perhaps the examples described above provide methods for implementing tasks in a real-world context. Dr. Kelley used small whole problems (responses to pre-school cases) which included student application, peer-peer demonstration, and instructor feedback and guidance, many times throughout the course. However, in the pre-school lab, she used much larger whole problems (student-generated lesson plans) which also included students application, peer-peer demonstration and feedback and guidance. I would designate each of these as whole tasks of different sizes, adapted to the context of the specific context in which the design takes place. By nature, whole problems or tasks are components of larger tasks, and selecting the appropriate “problem” must fit the constraints of the instructional context and be tailored to the needs and prior knowledge of the students who will receive the instruction. However, there is little guidance on how this can be effectively done, and much is left to the instructor to determine how large the task should be based on the instructional context. Three of the instructors in this study used activation strategies to varying degrees. However, some of these strategies were more passive in nature. For example, Merrill wrote that learning is promoted “when learners are directed to recall, relate, describe, or apply knowledge from relevant past experience” (p. 46). This statement implies active participation by the students. However, two of the three instructors who used activation in this study employed more passive strategies by verbally reviewing previously learned materials at the beginning of a class or during lecture. Dr. Sumbramony, did use an interesting active strategy for activating student prior learning. As noted above, this strategy included asking questions to activate the graduate students’ prior knowledge. His questions began very basic and gradually became more complex and abstract, finally moving into the content of the course. This strategy appeared to allow the students to see the relationship between the more fundamental principles of economics and the complex content being taught in the course. One interesting finding was the instructors’ use of a cycle of instruction including demonstration of multiple whole task or problems and student applications of those whole tasks. Interestingly, these cycles of instruction varied from course to course and from task to task. Cycles of instruction varied from several cycles within a 50-minute class to cycles lasting several days. These cycles appeared to change based on the size of the whole task or problem on which the instruction was centered- the larger the task or problem, the longer the cycle appeared to take. This seems to confirm the flexibility of these principles and the potential to adapt them to specific needs and contexts. I was impressed with how these professors use these principles of instruction seamlessly in their teaching strategies. Instructors move between the phases of activation, demonstration, application and integration fluidly many times during a single class. This fluidity highlights the dynamic nature of these principles and provides examples of how to integrate them effectively in a course. The additional themes that emerged during the study provide great insight into how excellent teachers personalize their instruction while naturally implementing First Principles. Many of these additional characteristics and techniques appear to fit with what Keller (2008) has called First Principles of Motivation, which he based on the ARCS model of motivation (Keller, 1987). These principles are designed to increase student motivation to learn, and the instructors in this study clearly used several of the components outlined. The professors gain and maintain students’ Attention through the use of humor and enthusiastic teaching. They instill Confidence of success in their students by challenging them and giving them compassionate guidance in their studies. They also provide real-world experiences that give students satisfaction of Success (Keller, 2008, p. 176-178). These characteristics and techniques seem to act as facilitators of effective instruction based on First Principles. First Principles alone would not appear to be as effective as First Principles with these facilitating principles. Figure 2 highlights how these principles appear to work as facilitators of First Principles. Figure 2. The additional themes identified in this study appear to facilitate student movement through the phases of instruction. This study confirms the existence of First Principles of Instruction and links the use of these principles to high quality instruction. It is worth noting that these principles were used by teachers in content areas that are very different in nature. The presence of these principles in several different settings in higher education highlights the ubiquitous nature of First Principles and shows that they can be present and utilized, “regardless of program or practice” (Merrill, 2002, p. 43). This study also suggests that recognized instructors naturally employ both principles of instruction and principles of motivation in their teaching. This study has discovered two things. First, it confirms the existence and use of First Principles of Instruction and links their use to effective instruction in higher education. Second, it emphasizes that the effectiveness of these principles is potentially enhanced through positive motivational strategies and characteristics. Because principles are general in nature, work must be done to “examine the specific problems and best practices that can be applied in a given situation (Keller, 2008, p. 175).” Therefore, future studies should identify how First Principles of Instruction function in specific learning contexts. For example, work should be done to identify how First Principles of Instruction are used in an online environment in higher education. Future research should also study the interaction between First Principles of Instruction and First Principles of Motivation in a variety of settings. Identifying how these motivational and instructional principles interact can give us greater insight into designing effective and motivating instruction in many environments, contexts. To bring life to Merrill’s First Principles of Instruction, we should observe how they are used in real settings. This study provides some insight into how these principles can function in higher education. To advance as a field, we should be willing to analyze how theory functions in realistic settings and discover methods for using and personalizing instructional theories like First Principles of Instruction so that they can be made more accessible to teachers and instructional designers in many settings. Association for Educational Communication and Technology, (2009).Knowledge Base. Retrieved April 25, 2009 from http://www.aect.org/default.asp. Duffy, T. M., & Cunningham, D. J. (1996). Constructivism: Implications for the design and delivery of instruction. In D. Jonassen (Ed. ), Handbook of research for educational communications and technology (pp. 170-198). New York: Macmillan.Frick, T., Chadha, R., Watson, C., Wang, Y., Green, P. (2009). College student perceptions of teaching and learning quality. Educational Technology Research and Development, 57(5), 705-720. Gall, M. D., Gall, J. P., & Borg, W. R. (2007). Educational research: An introduction. Boston, MA: Pearson/Allyn & Bacon. Gardner, J., & Jeon, T. K. (2009). 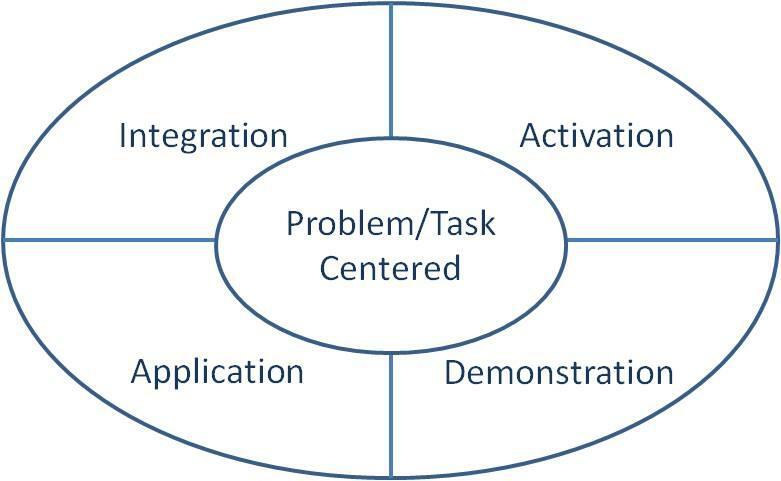 Creating task-centered instruction for web-based instruction: Obstacles and solutions. Journal of Educational Technology Systems, (38)1, pp. 21-34. Glesne, C., & Peshkin, A. (1992). Becoming qualitative researchers. New York: Longman. Keller, J. M. (1987a). Development and use of the ARCS model of instructional design. Journal of Instructional Development, 10(3), 2–10.Keller, J. M. (2008). First principles of motivation to learn and e3-learning. Distance Education, 29(2), 175-185. Merrill, M. D. (2002). First principles of instruction. Educational Technology Research and Development 50(3): 43-59. Merrill, M. D. (2007). First principles of instruction: a synthesis. In R. A. Reiser & J. V. Dempsey (Eds. ), Trends and Issues in Instructional Design and Technology, 2nd Edition (Vol. 2, pp. 62-71). Upper Saddle River, NJ: Merrill/Prentice Hall. Merrill, M. D., Barclay, M., & van Schaak, A. (2008). Prescriptive principles for instructional design. In J. M. Spector, M. D. Merrill, J. J. G. van Merriënboer, & M. P. Driscoll (Eds. ), Handbook of Research on Educational Communications and Technology (pp. 173-184). New York, NY: Lawrence Erlbaum Associates. When there was writing about the residency side then the difficulties arrive and then this site http://www.nursepersonalstatement.com/writing-a-killer-staff-nurse-personal-statement/ is there to help you up in time. It is quite difficult to complete medical side personal statements in little time but you can here are the findings to discuss about them in this way as it should be. I think these professors need appreciation from people. They just need to browse this site and learning can be so easy and cn spread eduction. Big achievements are only possible when we have some motivation. From online resources http://www.summarizemypaper.com/ we can get best help and this is really in favor of all of us.